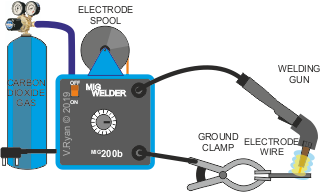 Electric arc welding - the metal to be welded is clamped in the earthing /ground clamp. An electrode is gripped in the electrode holder. A suitable ‘current’ is selected by turning the current selector handwheel. When the electrode comes into contact with the metal, an ‘electric arc’ is formed, creating immense heat. At this point both the electrode and metal surface melt and fuse together, creating a weld. Spot welding - used to join sheet metals. The metal sheets are placed between two copper electrodes. Current is passed through the metals via the electrodes, producing a ‘localised’ high temperature, causing the two sheets to fuse / weld together, at the point of contact. Advantage - welding is localised. Therefore, the rest of the material, does not suffer the effects of the high temperatures. The electrode is a continuous stream of wire, with a direct current source and fed through the welding gun. Carbon dioxide gas is supplied directly to the welding zone, protecting the area from atmospheric contaminants. The electrode, produces an ‘arc’, heating the welding area and fuses the wire electrode with the surface of the base metal (metal being welded). 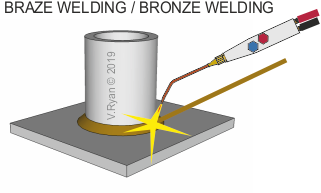 TIG welding uses a non-consumable electrode, which produces the arc, creating the heat required to weld (melting and fusing the surface of the metals being joined). The electrode does not melt during the welding process. The filler rod is fed into the weld area by hand. The protecting gas is usually argon, which prevents contamination from gases in the air. 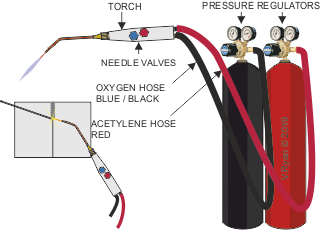 Oxyacetylene gas welding is often used to permanently join mild steel. A mixture of oxygen and acetylene, burns as an intense / focussed flame, at approximately 3,500 degrees centigrade, melting the surface, forming a molten pool, allowing welding to take place. Oxyacetylene can also be used for brazing, bronze welding, forging / shaping metal and cutting. This type of welding is suitable for the prefabrication of steel sheet, tubes and plates.